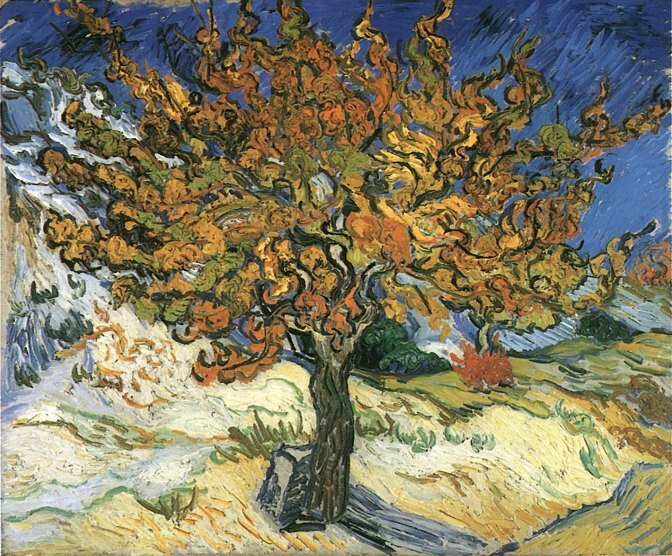 Good excuse as any for van Gogh’s Mulberry Tree (one of my favorites). The first thing to pay attention to in today’s passage comes in v.1 – Jesus is talking to the disciples here and this is another “woe” directed specifically at them (remember the ones in the Sermon on the Plain in ch. 6 were for them too). What follows is pretty demanding stuff. Followers causing other followers to stumble is bad. Jesus demands that we watch ourselves and watch out for each other. If we see one follower sinning and hurting other followers, we have an obligation, a mandate, to speak up. We fail at this responsibility far too often (the first person plural there is quite intentional). But we are also to be quick and continuous with our forgiving. The grammar here in Greek is really close to what was in the Lost Son story where he repents and the father forgives him. That passionate compassion is an important part of speaking up when one brother or sister is hurting another. Ideally it is both together, though in practice this can be hard to maintain, especially when people resist correction. Which makes the explanation of the servant here apropos. Could there be a clearer depiction of how the kingdom is not all about me? We are here to serve, not be served. There are amazing benefits to being a follower of Jesus, just like there are great perks of being on the personal staff of a billionaire (at least I imagine there are: yacht rides, polishing fancy sports cars, exotic locales – sure there’s work involved, but there are benefits, right?) But perks are called perks for a reason. They are side benefits, they are not the main focus of what’s going on. Way too many Christians are in this for what’s in it for them, for what personal sense of whatever they gain from it. As odd as it sounds, here Jesus is saying, ‘So, you’ve worked hard all day in the fields, working for the kingdom? Great! Now make me a sandwich.” Some of us need to figure out the working hard in the fields all day, that is shock enough. Then comes the kicker: that is us just doing what’s expected of us. Serving in the kingdom is almost never the above-and-beyond we make it out to be. Those who need constant praise for what they’re doing are among those who are prone to making others stumble. Let’s do our work with eagerness and humility and leave the glory to the One it belongs to. The healing story at the end drives this whole point home and also balances it nicely. Ten are healed – not because they earned it or deserved it or for any merit-based reason at all. Jesus knew nine of them weren’t coming back. Maybe they thought it was all about them or they were too busy enjoying their personal experience or whatever, but they were healed out of Jesus’ passionate compassion, nothing else. We serve because it’s our duty, we worship because we were made to do so, but what we receive from God is not tied to our service or our worship. We can’t earn our way to a healing. We can’t worship our way to a healing. The grace of God is free. Always. Even healing grace. All ten trusted Jesus enough to start walking toward the priests. That minimal amount of trust in God’s grace – just enough to act on it – is all they had to have. And that’s enough to throw mulberry trees into the sea. Or onto a canvas.